This post used “Custom Service”, so please read this article to understand Dependency Injection in AngularJs. JSON data is input to table, which can be replaced by any server side JSON response. So, in case if you need to use this example in Salesforce, You simply have to change “getDummyData()“ method and get response using REST API. 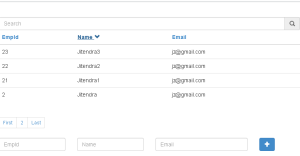 This article will be helpful if you are looking on how to generate JSON output in Visualforce page. Why do we need Service in above example ? It is always better to separate concern from Controller. So instead of writing methods or logics inside Controller, we have created Service and passed service as a parameter while declaring controller. Now we just have to call methods declared in service from Controller. If you are looking for same kind of Example in Salesforce then this is very Good Article written by Harshit and Mohit Srivastav. Thanks Harshit, Its good idea. I wrote the code but my sorting does not seems to be working correctly..
on line 103, you need to pass complete array instead of $scope.filteredList. Hi Jitender , First of all Thank you for looking into my issue. Can u plz post ur complete code ? Sorting does not work in Correct way . Please help .. I have used the above code given by you.It is displaying the table structure but,my problem is: it is not displaying the dummy data into table. Sorry but sorting is not working for numbers for whole data. Sorting for numbers is working for the respective page only. why complete data is not sorted when clicking on number format. Hi Dev, Can you give example in JSfiddle ? 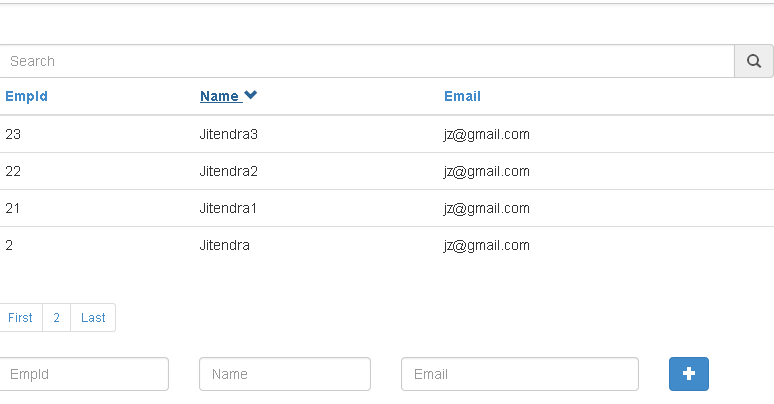 you can clone this example in Jsfiddle and provide URL which replicates issue. Hi the sorting is not happening across the pages.I tried changing the names starting with A,B,S,Z across the page so when I sort it shud be sorted across the page but its sorting on per page basis.For e.g. if my names are Zitendra,Sudra,Kinal on page 1 and Jitendra,Minal,Rudra on page 2 and Bitendra,Dinal,Tudra on page 3 when I sort asc order page 1 shud display names -Bitendra,Dinal,Jitendra; page2- Kinal , Minal,Rudra ,Page3- Sudra,Tudra ,Zitendra. But currenlty its sorting only on currentPage. Any idea how to fix this? Can you give example in JSfiddle ? you can clone this example in Jsfiddle and provide URL which replicates issue. If i have to refresh this datatable with new data how i can do this. I don’t anything about angularjs. Will this supports to display 50k rows without freezing. Not recommended , Angular uses your browser. So, if you are trying to show 50k record, chances are high that it will freeze. Great example for better understanding of these mechanisms, have a great new year and thanks for posting! how to do when user click in pagination for next page that time next records fetch from database. how to do ? ?